This is horrible. Why you make me do this ;_; I'm sorry pervy sage. "If only I had 5 lives! Fall in love with the same person 5 times." "I order you to love me and in return I will love you back. even how that cat always bites you. "Close your eyes as I return a favor. You thought I was going to kiss you, didn't you? But someday, I'll make you fall in love with me. "I said before we had something to talk about..
Well uh.. I'm not sure how to say this.. Uh.. wouldn't it be funny if we woke up tomorrow and we were boyfriend and girlfriend? Will you go out with me Nagisa? I love you Nagisa. So I want to spend every day of my life together with you." "But Kenshin can still smile. He always smiles, with a little sorrow hidden in all his kindness. Maybe one life can't change an age. But I at least want to be by his side. I want to always be by his side." and I said, "I'm home"? That was the first time I'd said those words ever since I became a vagabond. You are my home Kaoru." Lets spend the rest of our lives.. Creating memories that are even better." "Do you want to become a vampire, Yuuki? Become a blood sucking monster? What does Zero mean to me? I cant look away from those eyes." I might have been able to live on..."
Another easy choice here. 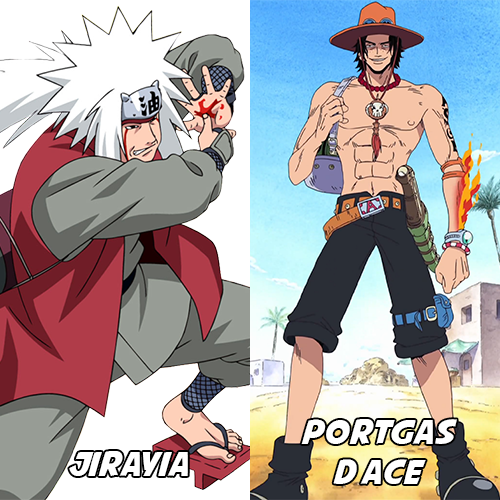 Definitely giving my vote to Jiraiya. Edited by Satoshi, 25 June 2018 - 07:35 PM. Omg leaving it up to yall and the final popl will be between 2 naruto characters. Smh i really dont want that to happen. Im so tired of naruto characters. It is surprising how well the Naruto characters have done in this OMCB. Traditionally they haven't done great from what I remember. Well Ace was my pick to win it all. I guess that after Luffy and Zoro the fall off to the next group of popular characters from OP was bigger than I thought. Lol. I nominated Ace so had to back up my man even against my other man no matter how pervy.. I mean great he is. Edited by Jekkusormi, 27 June 2018 - 10:54 PM. Jaraiya is kool and at some point he was my favorite character on naruto. What Ace did after escaping Marineford made him plummet for me.